Cutting edge findings that challenge "what we learned in school" about dopamine (DA) release were presented. New approaches, such as direct observation of DA uptake and release from individual presynaptic terminals, and new findings, including glutamate co-transmission in DA neurons, are contributing greatly to our understanding of the coding of incentive salience of conditioned stimuli and the mechanisms underlying enduring drug-seeking behaviors. The focus on presynaptic regulation of DA release is also relevant to schizophrenia, attention-deficit hyperactivity disorder, and Parkinson's disease. 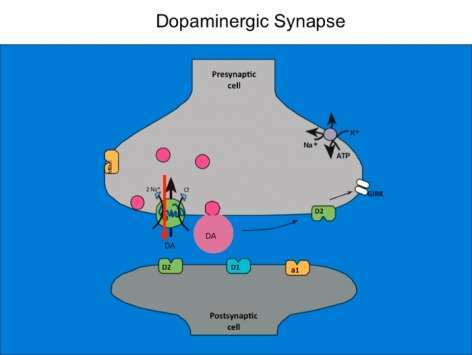 The dopamine transporter is commonly known for halting dopamine actions through re-uptake of the released dopamine into the presynaptic cell. Less well known is the fact that dopamine and other enzyme-influenced substances serve as an opening to an ion channel that is selectively permeable to chloride. Dr. Ingram-Osborn and her research team are currently exploring how this channel alters dopamine neuron activity. Transporter-controlled electrical currents represent unexplored avenues for cellular mechanisms of psychostimulant action and potential targets for novel treatments of drug addiction. In order to measure how dopamine neuron activity is modulated, the research team used whole-cell patch-clamp recordings from rat dopamine neurons in either culture or brain-slice preparations to characterize the dopamine transporter-mediated current. They found that dopamine transporter substrates such as dopamine and amphetamine gate a chloride current that reverses close to the resting membrane potential of the dopamine neurons. Activation of this current can increase the excitability of dopamine neurons, suggesting that activation of that dopamine transporter may enhance the release of dopamine. Recent data have demonstrated that the dose-response curve for amphetamine activation of the dopamine transporter-mediated chloride current is U-shaped, suggesting that amphetamine has different effects at low and high concentrations. Experiments designed to better understand chloride regulation in dopamine neurons are ongoing. Dopamine signaling via basal ganglia synapses is required for learning and for the selection of appropriate behavior. To determine how dopamine selects particular basal ganglia synapses, Dr. Sulzer and his research team developed optical techniques that measure activity of individual presynaptic areas. Synapses were analyzed in sections of the central nervous systems of mice, and synaptic pathways were stimulated extracellularly. The team's findings indicate that, at low frequency (1 Hz) stimulation, three types of synapses maintain normal distributions of activity. By 10 Hz, each synaptic pathway exhibits a fraction of terminals with substantially higher activity. Interestingly, methamphetamine administered in vivo creates permanent changes in synaptic selection, which the team members label chronic presynaptic depression and paradoxical presynaptic potentiation. These changes may last for the lifetime of the animal and are renormalized by amphetamine readministration and involve dopamine effects on cholinergic signaling. The ability to measure presynaptic activity in populations of individual terminals indicates an unsuspected range of activity within classical projections. This activity is dependent on neuronal firing patterns, so that simultaneous activation of neural pathways causes particular synapses to be selected. Dopamine contributes to this selection and can either dampen or enhance activity of particular presynaptic terminals in a frequency-dependent manner, depending on involvement of particular receptors. Together, these findings may explain how the union of two or more neural pathways alters synaptic strength such that appropriate behaviors are learned and selected. The ability of an addictive drug that releases dopamine to produce the longest changes in synaptic plasticity yet reported may underlie lifelong alterations involved in dependency.